Have you ever wanted to visit the locales depicted on AMC’s The Walking Dead without fear of a zombie attack? Now’s your chance. Via Entertainment Weekly, Riverwood Studios in Senoia, Georgia is offering fans the opportunity to explore the sites of various major events seen on the show’s more recent seasons. Riverwood Studios has been the home of The Walking Dead for almost 10 years. Tours of the series’ sets run Fridays through Sundays beginning December 14 and last approximately two hours. Traveling by bus, guests will be able to wander through almost every gated settlement introduced on the show. 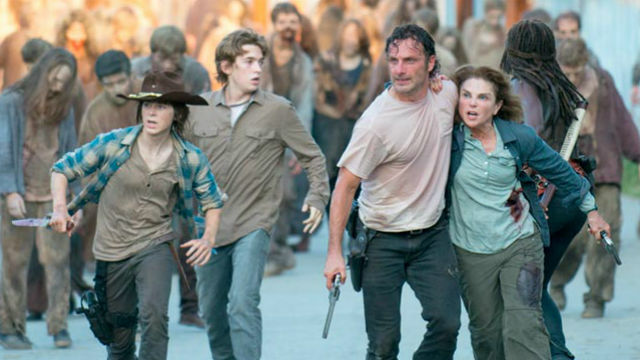 That includes Hilltop, the farming community led by Maggie until recently; the Sanctuary, the main outpost of Negan and his Saviors; the Heaps, where Anne/Jadis lived with her aloof band of Scavengers; Oceanside, arguably the most isolated community presented on the show; and Alexandria, which has been the primary home of Rick Grimes’ group of survivors since season 5. The Governor’s town, Woodbury, is also on the tour even though it was set ablaze in season 4. Visitors also have the chance to pay tribute to Glenn and Abraham at the forest clearing where Negan killed them. Finally, the houseboat surrounded by a walker-infested lake will be accessible during the tours. The only set that appears to be absent from this list is Ezekiel’s Kingdom, but it isn’t clear why that is. Ticket prices are $65 for adults and $45 for children under 12. You can find more photos and details about the sets here. Are you excited by the prospect of visiting the world of The Walking Dead firsthand? Share your thoughts in the comment section below!